Save the Date and register now for the 2019 NC Transportation Summit, presented in partnership by NCDOT & NC Go! For more information on attending, sponsoring or exhibiting, Click here now. Thank you to all of our 2018 Annual Meeting Sponsors! Click here to view the organizations helping to make our event possible. 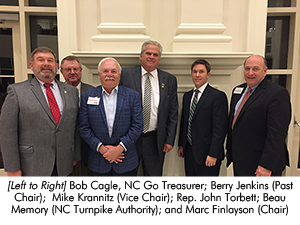 Make plans to join us for the NC Go Annual Meeting with special guest, Transportation Secretary Jim Trogdon. Registration is now closed – the Event is Sold Out!. Become a transportation advocate today! Transportation is more than roads. High-Speed Rail investment will keep North Carolina on track in the 21st Century.